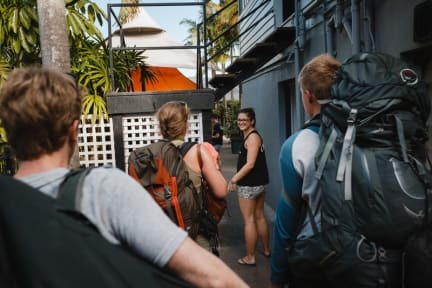 Mad Monkey Backpackers Cairns i Cairns, Australien : Boka nu! Best hostel in Australia! The free breakfast is a reason to wake up, the wifi is incredible and the staff is really friendly. Big lockers in the room and AC. Chill atmosphere in the bar and good prices for food during happy hour. Stayed for 3 weeks, I recommend you atleast try one. One of the best hostels I have ever stayed at, the breakfast is more then just the typical white bread or just pancakes. The hostel just feel fresh and renovated, the beds are really nice as well. The only thing is you can't bring your own alcohol, but you can buy in their own bar at a affordable price. Very good hostel! Big and clean kitchen. Amazing breakfast, great daily activities. Free FAST WIFI all over the hostel, probably best wifi I've experienced in Australia. Great place, highly recomended. The best hostel I've stayed at! You can borrow basketballs etc, you can use a gym for free and they have Netflix on the TV. Could have been a bit cleaner (the bathrooms), but I didn't mind. The atmosphere was amazing and they arrange great activities so it's really easy to make friends. I would definitely stay here again! BÄSTA!! Vi bodde här 7 nätter - så jäkla glad för det. Gratis frukostBUFFE, Netflix vardagsrum, aircondition på rummen och supersköna sängar. Skåp som man kunde låsa in grejerna i. Tips!! Det finns ett badrum med badkar nära rum 315, det var så skönt att duscha där. Sen är personalen väldigt hjälpsam och hostlet ligger nära till ALLT. Tveka inte att bo här i Cairns, tipptopp! Quite big but nice hostel. Alot of backpackers working there but they seem pretty organized. Travel agent in the same building so really easy to book tours. Hostel arranges activities, beer pong tournaments, nights out, bbq etc. Eazy to make new friends in the kitchen, common areas or while watching a movie on the big screen. Pool is nice too! Well kept place, I'd definitely stay again! We had a nice stay at Mad Monkey. The location was awesome and the staff was helpful. However the kitchen needed a deep cleaning. The floor we stayed at seemed to have problem with mould there were stains in the roof in the bathrooms and there was a strange unfresh smell in our room. In spite of this we enjoyed our stay.